Art has always treaded a treacherous territory, eloquently arguing things that matter most. Art has always treaded a treacherous territory, eloquently arguing things that matter most. It’s not just a solitary practice for one’s personal joy, but a democratic instrument for dialogue. In this regard, trends are important monitoring tools for the documentation of a society’s present psychological hunger for ideas. Staying on top of the trends list, we bring you goals that ride art on a high tide. Using art for activism, feminine forms have caught the imagination of artists and buyers alike. The kind of portraits we see today are a result of evolution of perception. Back in the day, women were painted through a man’s gaze. Today, women painters have taken up the intimate art of painting portraits of women depicting anguish and despair.Simple is stylishAlso called Essential Art, this form comprises basic, minimalistic sketches using a pencil or a brush. Usually these are monochromatic works with line drawings that have lots of curves, sharp angles and mild shading. Artists deconstruct complex imageries and present its essence through narrow lines. 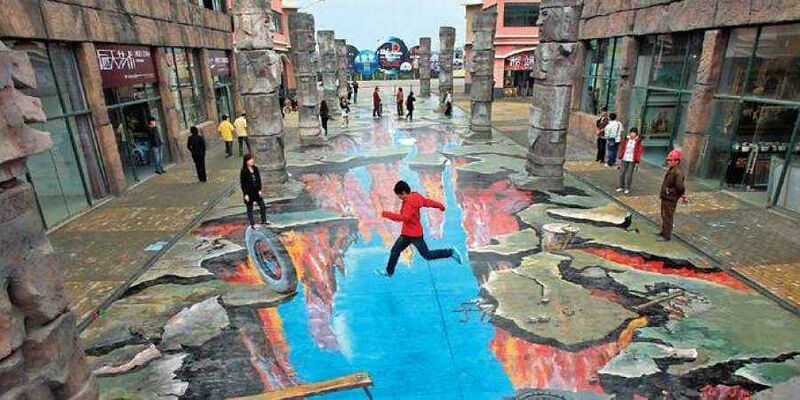 Julian Beever and Edgar Mueller take a bow. Having made 3D art an all new genre, these pioneering artists have introduced a creative style that is unique and challenging. Using anamorphosis or distorted projection they have become illusionists par excellence. Usually 3D paintings are best expressed on large natural canvasses such as pavements and large walls, but of late, smaller versions of it are being framed to practical sizes. Botanical art has undergone a renaissance of sorts. From painting just floristic wealth, to now capturing the botanical diversity of the plant kingdom, this green art has seen a lot of patronage in the last few years. Botanical prints are economical and easily available. Pick up a bunch and frame them. Be mindful of the spacing and proportions. Visual communication in graphic art is done through typography, iconography, imagery and form, making graphic art diametrically opposite from other conventional art form. It’s about using technology to create wall masterpieces. Mostly set against a dark background, neon circle art has come out as a psychedelic game changer this year. The medium is not limited to paint. Neon circles are being created with LEDs, glass and glow sticks to dress up your spaces. Some of them have dimming controls. Smart phones have made everybody a photographer, and using cameras for fine art. This form of art has become trendy particularly because of its inclusiveness. It makes everyone an artist. Scout for a picturesque location, find inspiration and shoot away.